Riffle: Titus, it's your anniversary! Titus Oates, with a name that sounds like a country singer's, was a scoundrel. He fabricated the Popish Plot -- which led to the execution of over fifteen innocent men and which exacerbated an anti-Catholic mood into a frenzy -- and committed sundry bad deeds that were more prosaic. That was probably too good for him considering the standards of the day. But yearly pillory was something I hadn't considered before. It is nearly the anniversary of his birth (15 September 1649). I'm curious as to what was the day (or days, or week, or month) for his annual pillory. Would have made for a whale of a birthday celebration if they combined them. 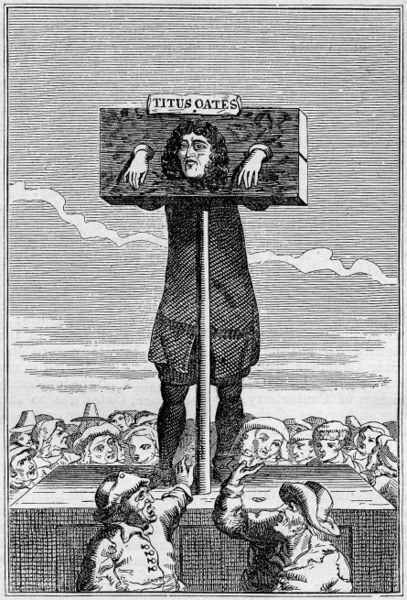 Oates went from penury to having Whitehall apartments and allowances, to various punishments, to a small royal allowance, then a suspension of that allowance, then a bigger royal allowance of £ 300. Ultimately, I understand, he died. It's the time for scoundrels to whip a froth into a frenzy, human suffering be damned.